I’ve just recently begun getting reacquainted with beets. I didn’t eat many as a child and if I did they came out of a can, mushy and tinny tasting. I had no tolerance for them. My mom must not have liked them either because I recall seeing the same can of beets in our pantry for so long it looked like an antique, a faded white label next to all the dark green. Of course, over the last few years, beets have become the darlings of the culinary world so I’ve decided to step ever-so-cautiously onto the bandwagon. 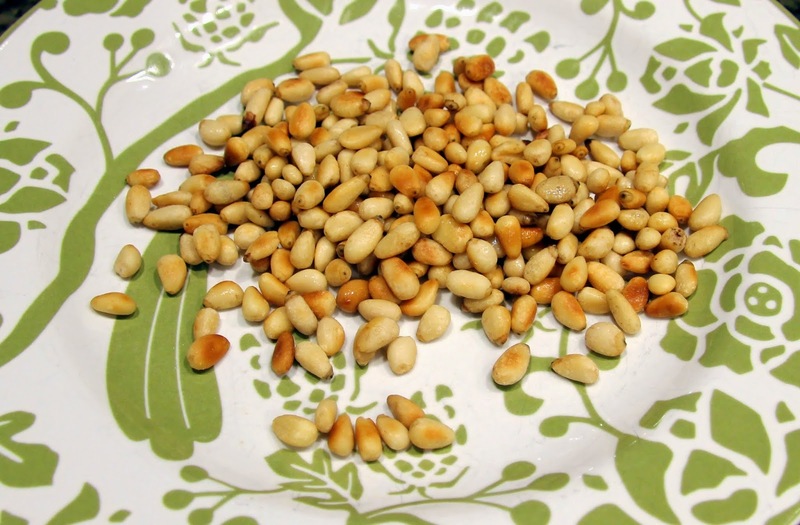 So far I’ve only tried them roasted, mostly in salads at local restaurants and they inspired me to come up with my own version. Someday I may even branch out and try them raw or pickled. The health benefits are worth more experimentation for sure (http://articles.mercola.com/sites/articles/archive/2014/01/25/beets-health-benefits.aspx). 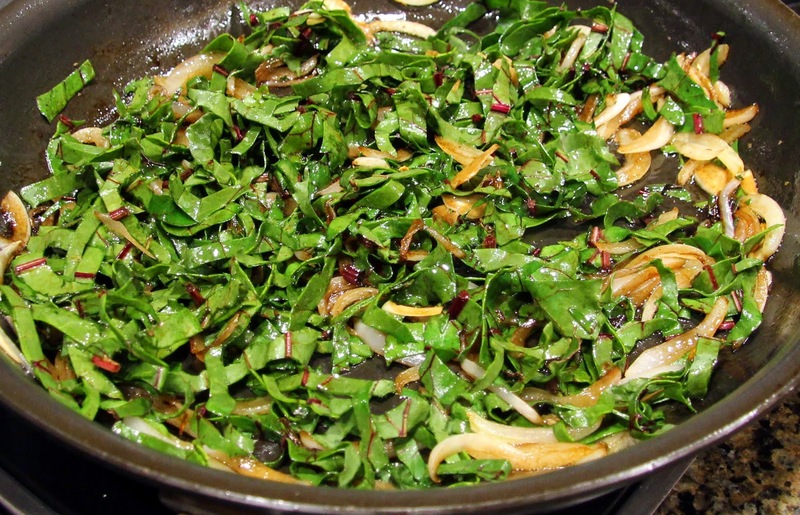 Oh, and don’t throw away those beet greens! Treat them like you would chard or kale, thinly sliced, raw or sauteed or throw them in your juicer for a super healthy boost. 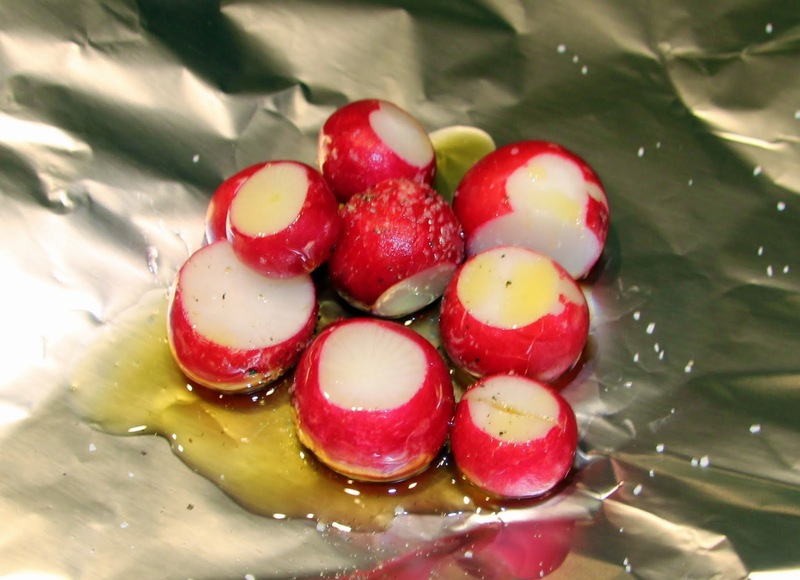 If you’ve never roasted radishes before, you are in for a pleasant surprise. This was a first for me and a total last minute decision. I saw them in the fridge next to the beets and a little light bulb went on (not the one in the fridge, it’s been burned out for ages) and I remembered reading something about roasting radishes. I am so crazy I decided to try it. They ended up having this really mellow, earthy flavor, almost like an onion but more mild, and smooth texture that paired wonderfully with the sweet roasted beets. 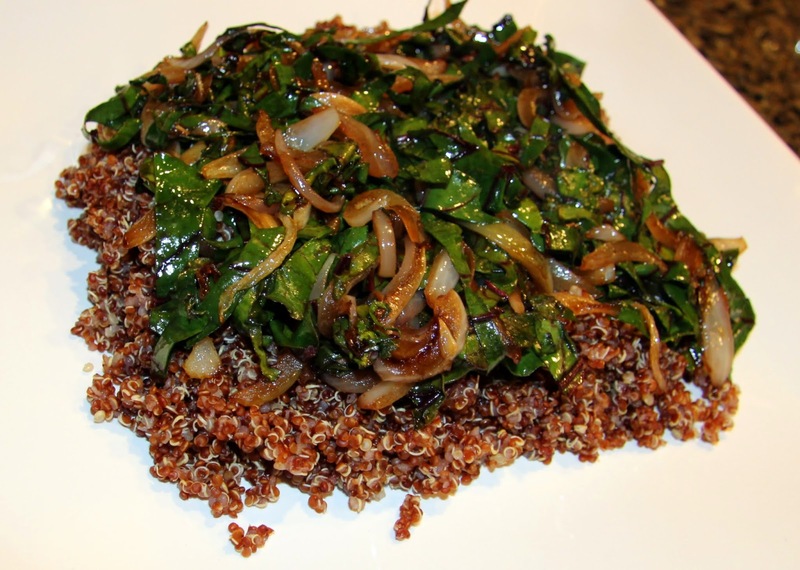 This can be served warm or cold and makes a great side dish or meal on it’s own. 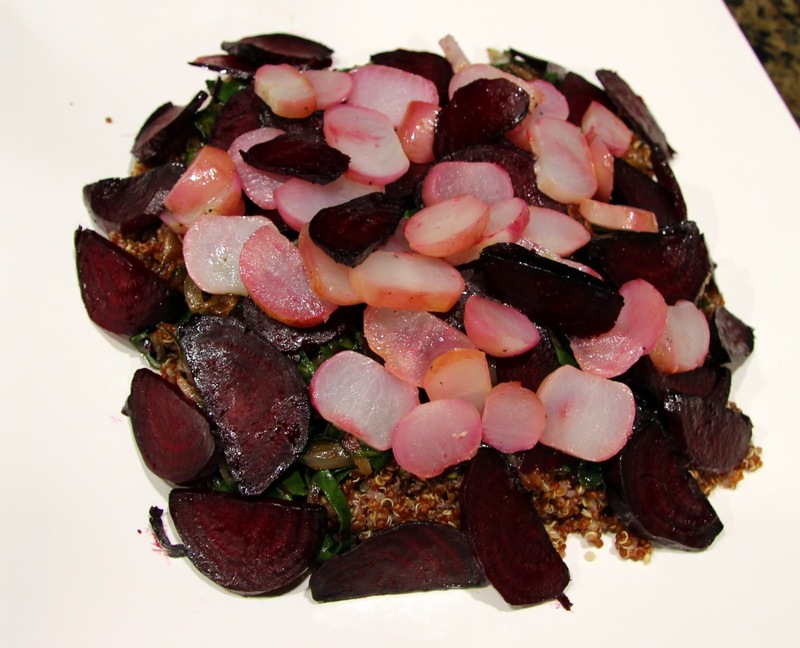 There might seem to be a lot of steps but it comes together pretty quickly as you can cook the quinoa, toast the pine nuts and prep the beet greens while the beets and radishes are roasting. Read through all the steps first to help with timing. 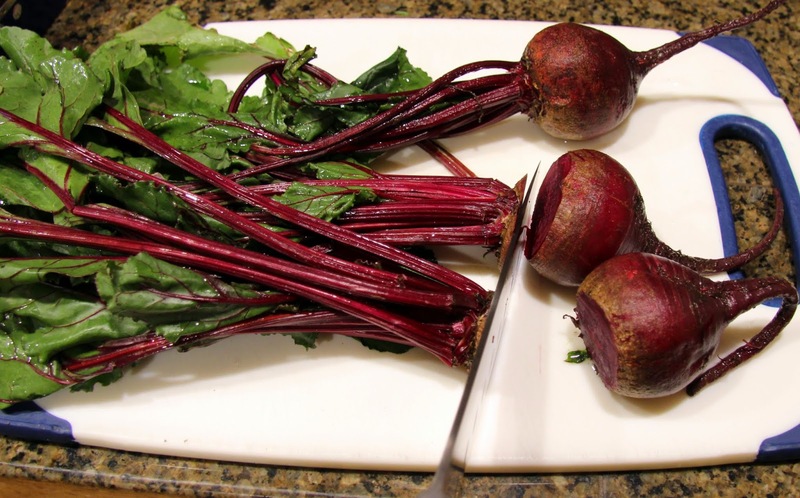 Remove beet roots from the greens. Set the greens aside to use later. 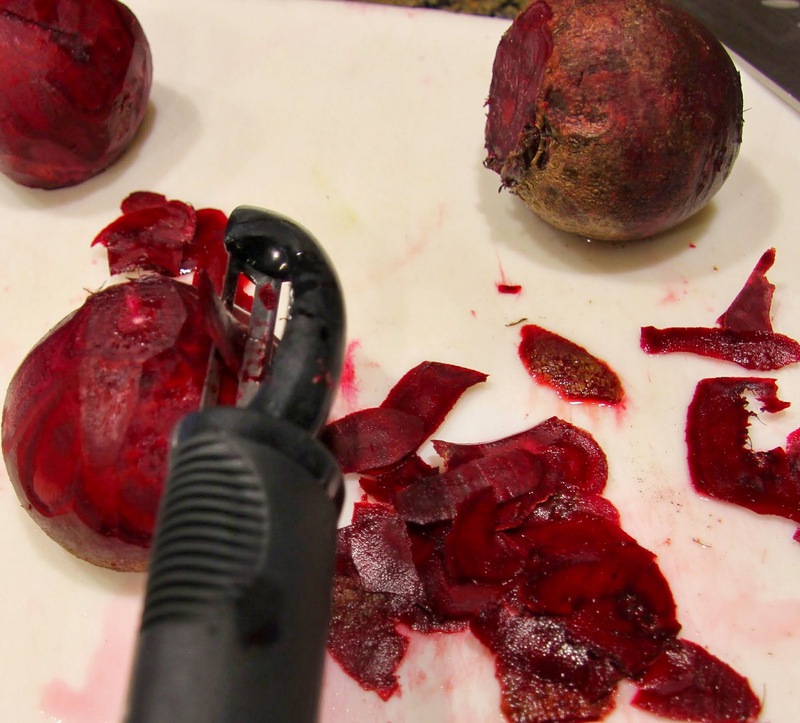 Cut off the other end and peel the beets to remove the rough outer layer. Cut each beet in half. 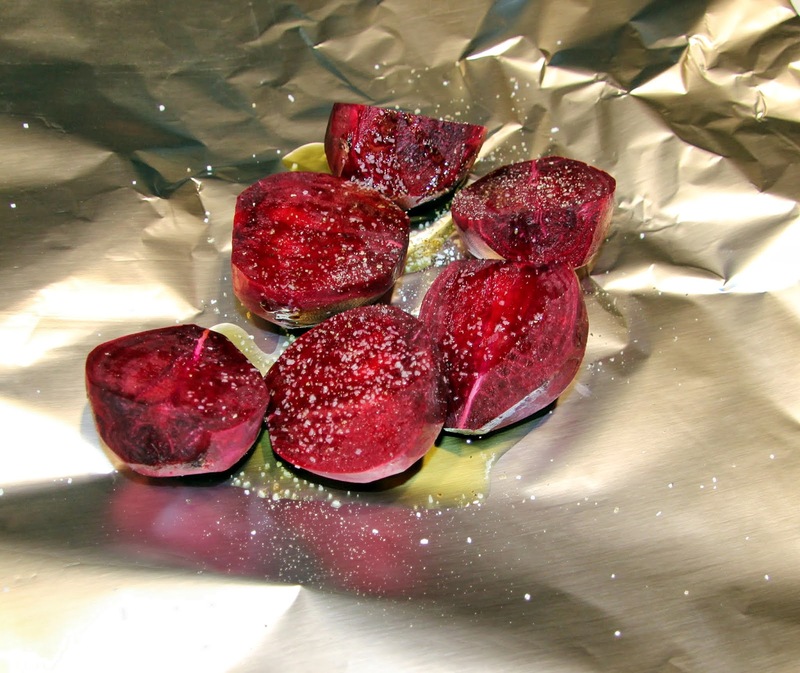 Place beets in foil (heavy duty if you have it or double the foil so it’s thicker), drizzle with olive oil, enough to lightly coat, and sprinkle with a pinch of salt and pepper. 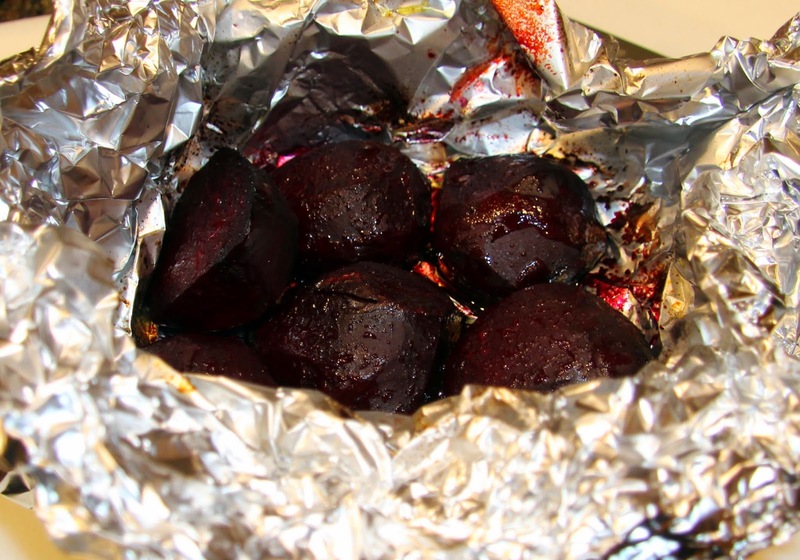 Wrap the foil tight around the beets and place on a baking sheet. 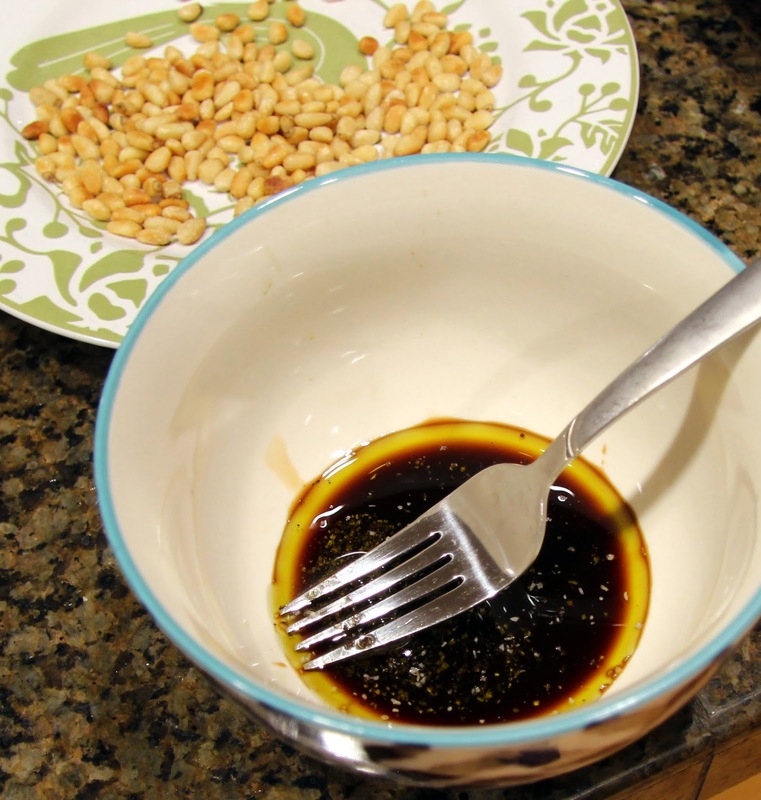 Roast for 35- 45 minutes, or until soft when pierced with a fork. Set your kitchen timer, you might be distracted preparing the other components of the recipe. 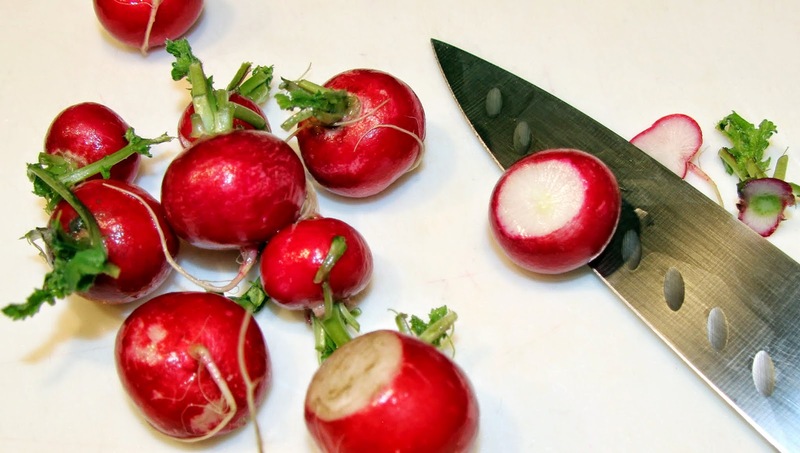 Cut off stems and bottoms of the radishes. 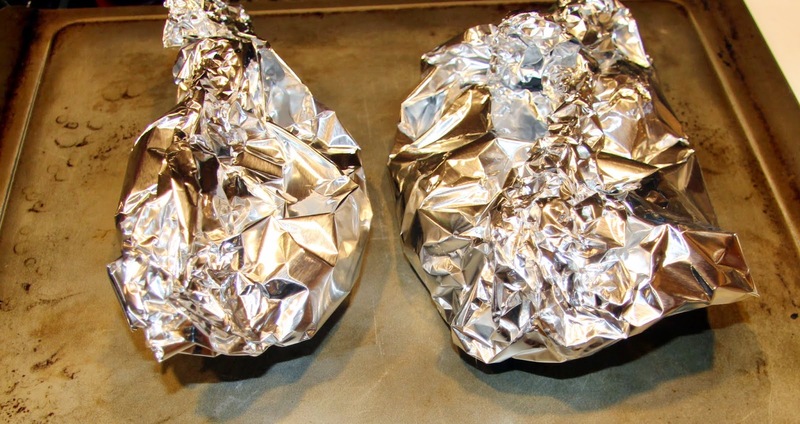 Place radishes in foil (heavy duty if you have it or double the foil so it’s thicker), drizzle with olive oil, enough to lightly coat, and sprinkle with a pinch of salt and pepper. 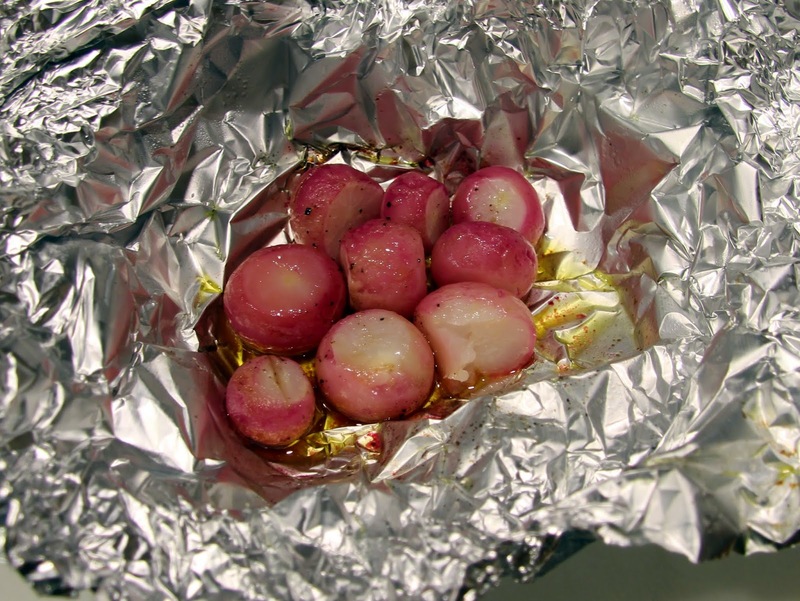 Wrap the foil tight around the radishes and place on the same baking sheet as the beets. 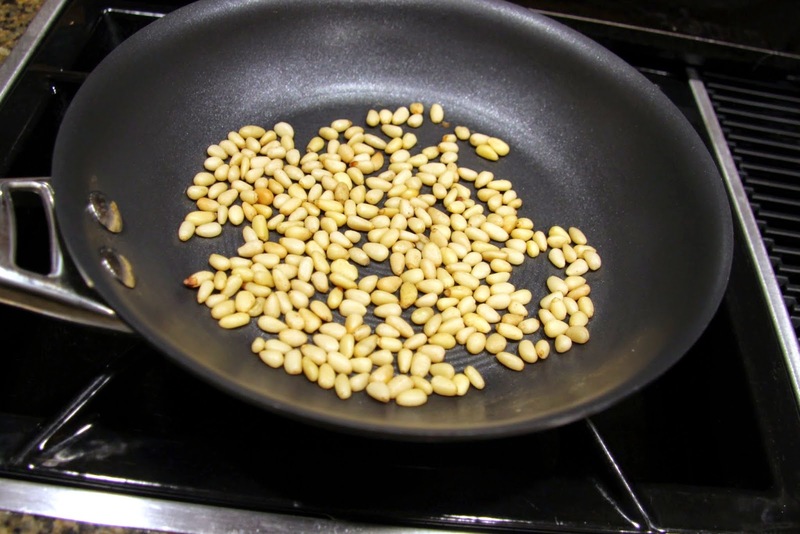 Roast for 25 – 35 minutes, or until soft when pierced with a fork. 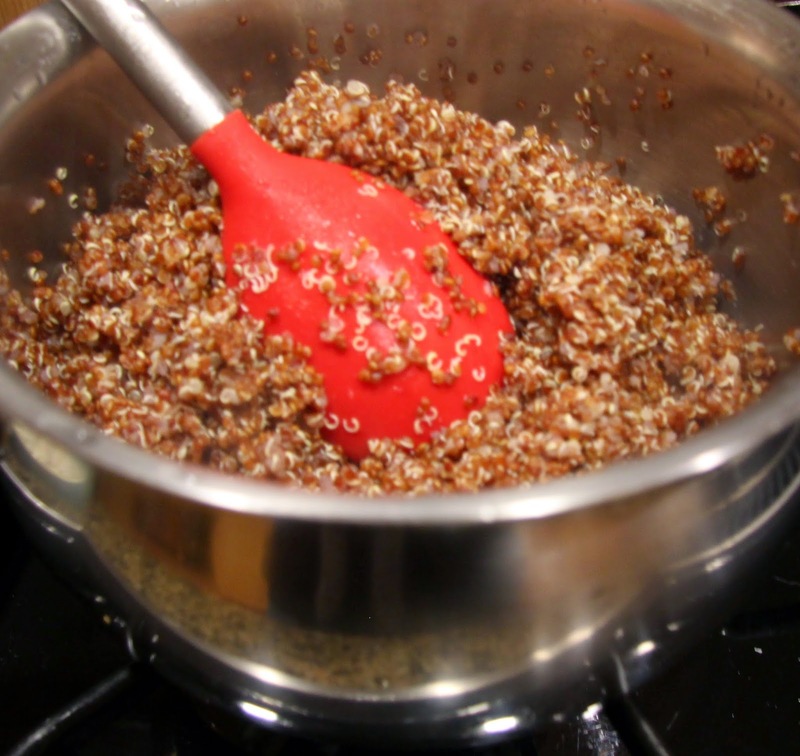 Rinse one cup quinoa in a mesh stainer before cooking to remove bitterness. 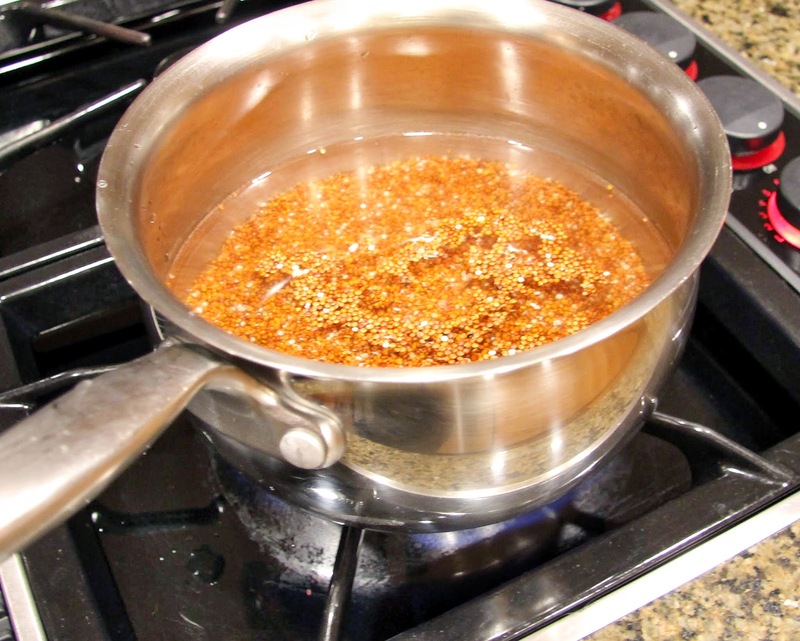 In a medium size saucepan, bring to a boil over high heat, stirring frequently, with 1 3/4 cups salted water. Reduce heat to low, cover saucepan and allow to simmer, stirring occasionally, until water has fully absorbed, about 15 minutes. Set aside to cool down a bit. 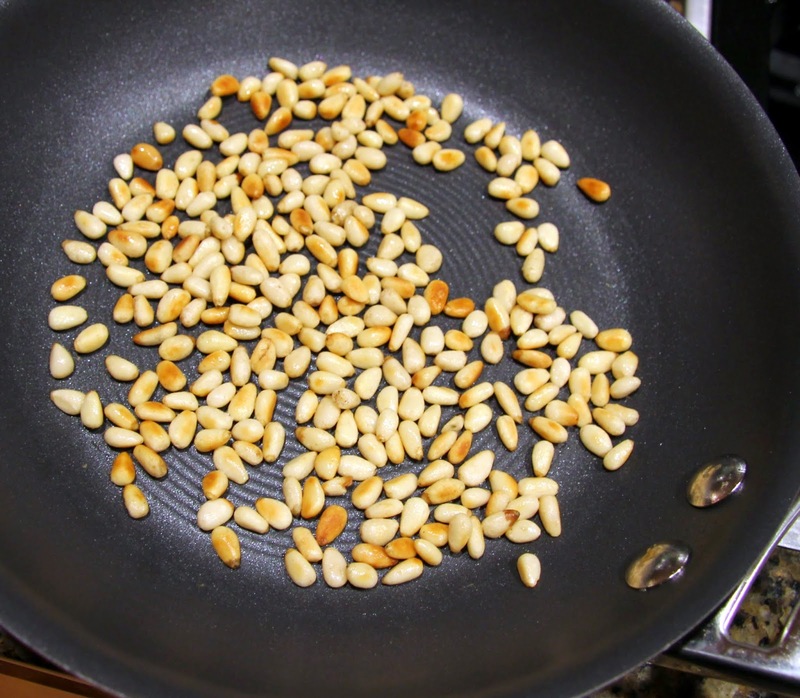 While the quinoa is cooking, toast the pine nuts in a small pan on medium heat. You’ll want to stay very close as they burn rather quickly. 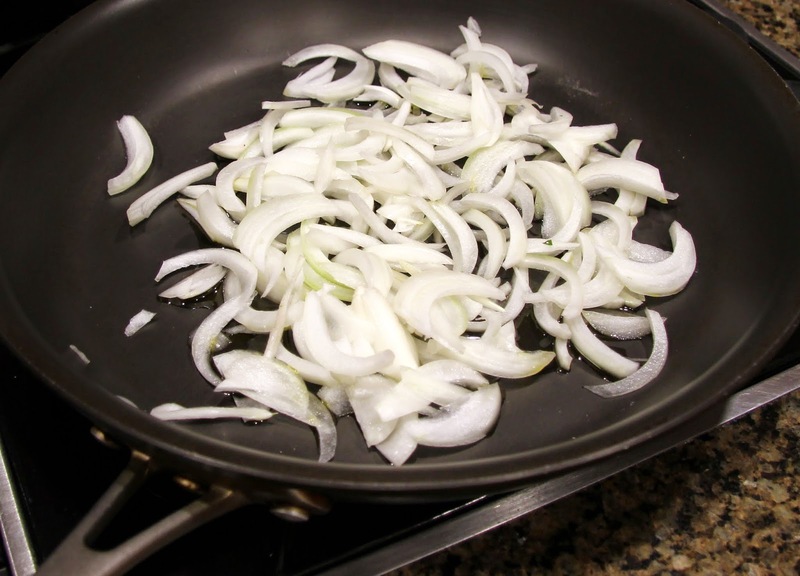 Toss them around in the pan until they are golden brown, then immediately turn them onto a plate to cool down. 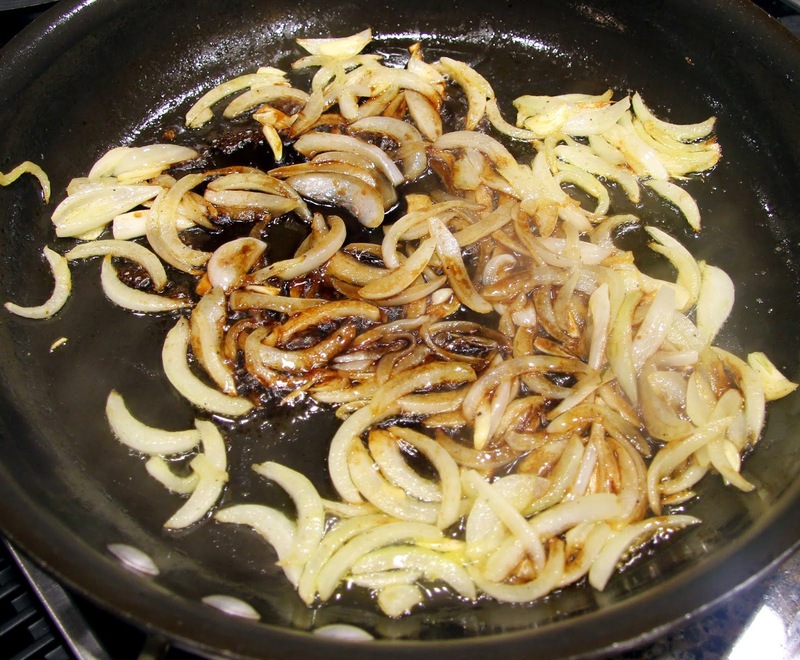 Place 2TB olive oil and thinly sliced onions in a large saute pan over medium-high heat. Cook until they soften and become translucent, stirring occasionally. 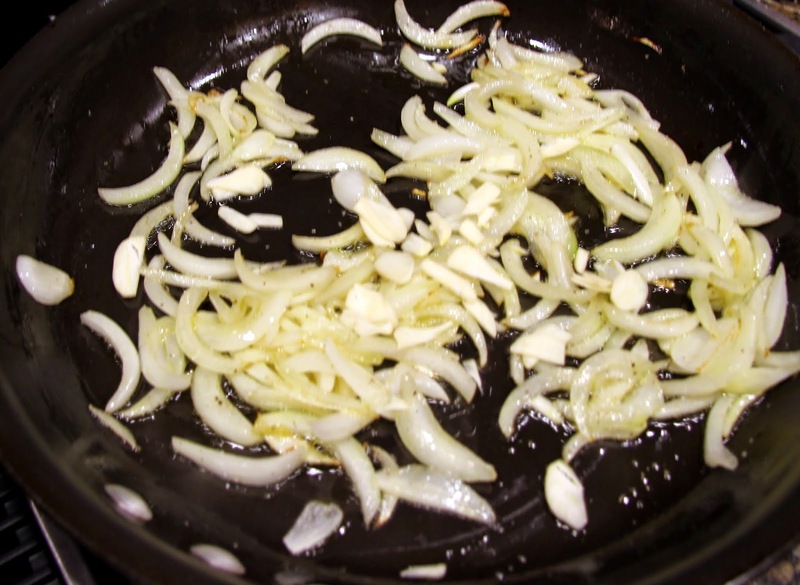 Add thinly sliced garlic and cook about 2 more minutes. 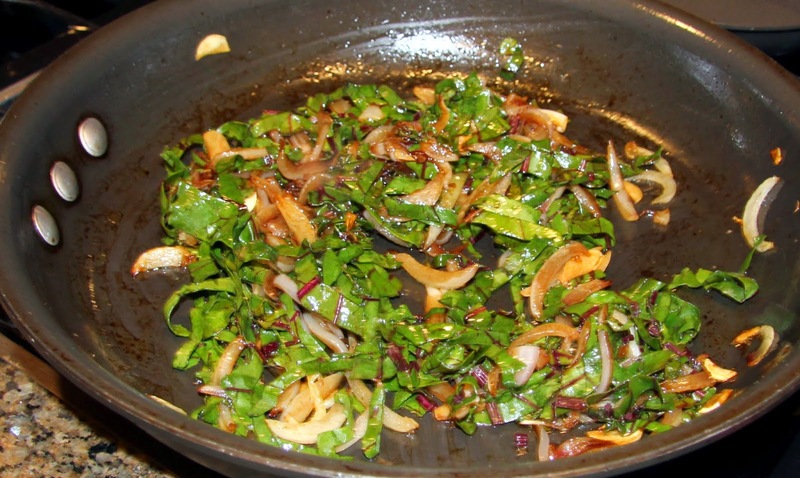 Stir in balsamic vinegar and a couple pinches of salt and pepper then add beet greens. Cook for a few minutes then remove from heat. 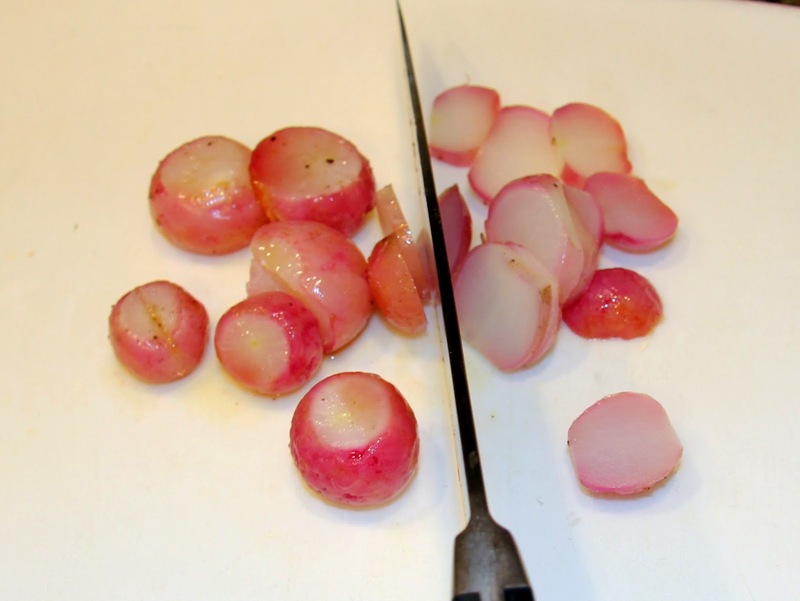 Once properly roasted, allow radishes and beets to cool off a bit then slice. 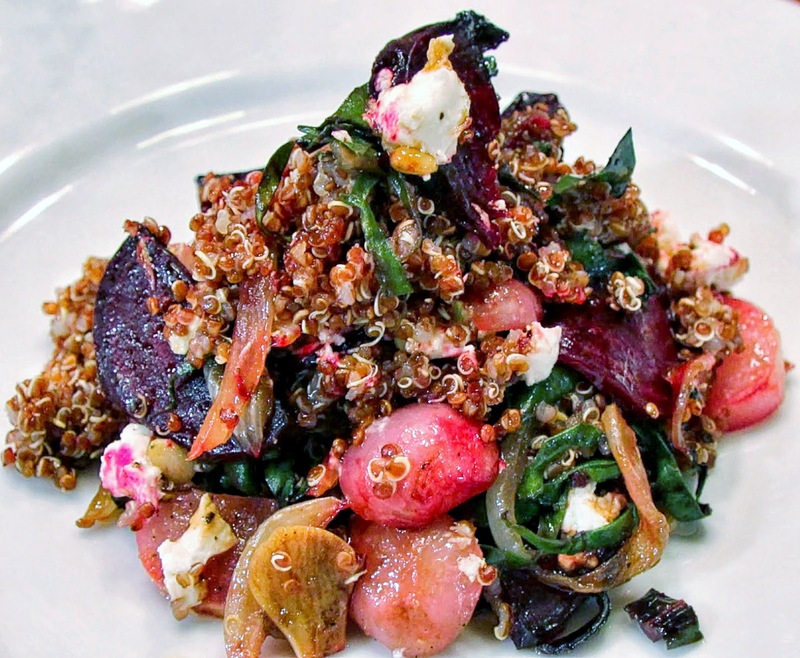 On a platter or in a wide, shallow bowl, place the quinoa down first in an even layer, followed by the onions/beet greens, then the radishes and beets. 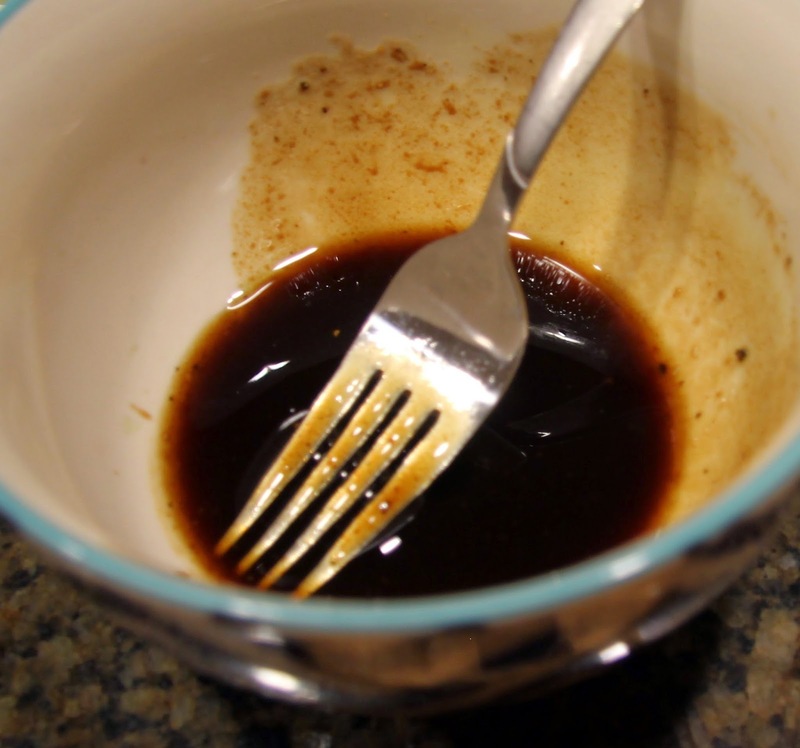 In a small bowl, whisk together 1 1/2 TB balsamic vinegar and 1 1/2 TB olive oil with a small pinch of salt and pepper to make a quick dressing. 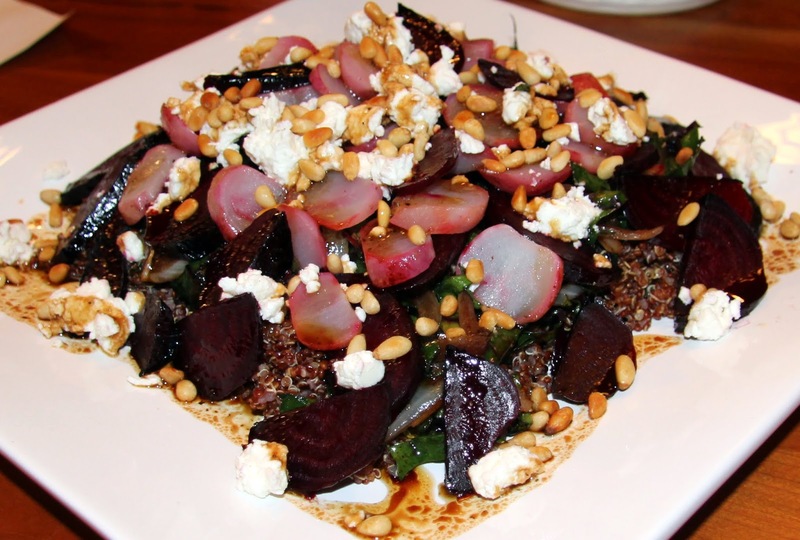 Crumble goat cheese over the beets and radishes, then drizzle with balsamic dressing and finish with toasted pine nuts. I prefer it served warm but Bob was perfectly happy with it cold when he came home late from work. It will keep in the fridge for a couple days if you have leftovers. I’m rereading Anita Moorjani’s book, Dying to be Me, in which she describes her journey through illness followed by a near death experience and what transpired in her life after that. Yes, I truly love books like this as I am fascinated with the afterlife! I thought I’d share one of my favorite quotes today.